A rare copy of the first Dandy annual published in 1938 has sold at auction for £1,250. 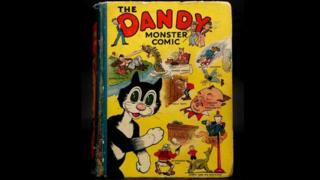 The Dandy Monster Comic was the first of 81 editions of the book, including annuals and other specials, to be published by Dundee-based DC Thomson. It was bought by a private client at a two-day book sale at Keys Fine Art Auctioneers in Aylsham, Norfolk. Featured comic characters, including Desperate Dan and Korky The Cat, went on to become household names. The annual, which had an original cover price of two shillings and six pence or half a crown (12.5p), had been predicted to sell at between £1,200 and £1,500. The Dandy comic was first published in December 1937 and continued until December 2012 in printed form, and then for a further six months online. It has now been discontinued but annuals and occasional summer specials continue to be published. The book is in remarkably good condition considering its age and was one of numerous collectables that came to the auction, said Keys' head of books Andrew Lindsay-Bullock. The auction house last year sold a copy of the first ever Beano annual, from 1940, for £2,700. "Along with The Beano, The Dandy is the archetypal kids' comic and, in fact, it pre-dates its stablemate by about a year," Mr Lindsay-Bullock said. "It is very rare to see a copy of the first ever Dandy annual and we saw a lot of interest from collectors from right across the UK and beyond for quite and eclectic range of books. "The Dandy annual is in such good condition because it was printed on stout paper and cardboard so buyers in 1938 would believe they were getting good value."